I read and reviewed Witch and Wizard in April of 2012. I was not a huge fan, mainly because it felt like the writer (writers?) couldn’t decide if they wanted to be clever or serious or juvenile or smart-assy. It was a combination that didn’t work for me. My daughter saw the graphic novel, and even though she did not finish the book series, since she loves manga, etc., she decided to give it a try. At her recommendation, I read the graphic novel quite a few months later. I, too, enjoyed this version much more than the book. The tone of the graphic novel is more consistent, and since we get a lot from the drawings (which are very nicely done by Svetlana Chmakova), the decrease in the amount of words only adds to the experience. The story centers around Whit and Wisty, a brother and sister who discover that they have magical powers. The New Order has been elected, and they are ferreting out anyone who doesn’t follow the new rules. Even though Whit and Wisty never knew of their abilities, they are taken into custody so they can be watched and used by the N.O. During this time, their parents disappear, they meet other children who have been taken, and they try to outwit The One Who Is The One. Best Thang ‘Bout It: I like graphic novels. I love pictures, and the ones here are well done. I know that the author/artist takes a chance with how they depict the characters (since we readers always picture something in our heads), but in this case, the artist’s renditions worked for me. The Bottom Line: For me, the graphic novel presents a better medium for the story. 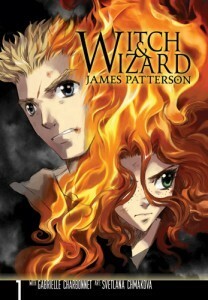 Witch and Wizard (Volume 1 of the Manga) was published September 20, 2011 by Yen Press. Ink and Page purchased this book, so no one had a choice about whether it was reviewed. Thanks for reviewing this Mom!! You’re welcome! Thanks for telling me about it.